Thanksgiving is a time for celebration, and at the Friendship Inn we celebrate with the large family of guests who eat meals together in our dining room. 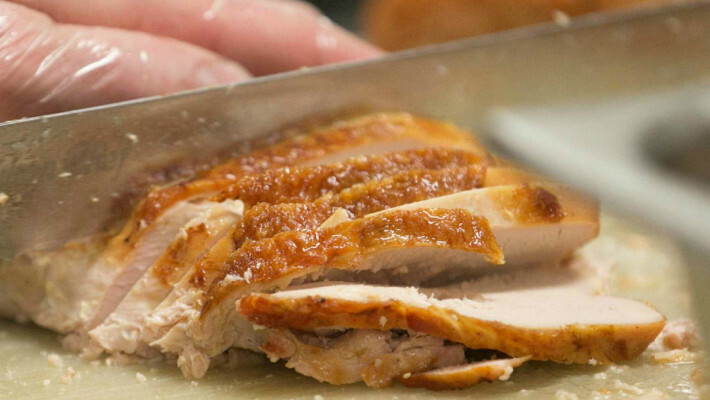 On Thanksgiving Monday we serve a traditional turkey meal at lunchtime, from 11:45am-1:30pm. Everyone is welcome to come to eat turkey together. In support of the Thanksgiving meal, we are looking for donations of whole turkeys, bone in ham, carrots, gravy (dry mix or canned) and individual packets of butter (a treat on the dinner rolls). Donations can be dropped off at the Inn 7 days/week 7:00am-2:30pm. Please come to the kitchen door off our parking lot on the west side of our building. Update: Thank you to all our donors and volunteers who made our Thanksgiving turkey meal possible! We served 1212 meals on Thanksgiving Monday, with some turkey to spare for leftover the following week – who doesn’t love turkey leftovers made into soups and stews!